In the past month, there has been a flurry of news features and articles about Cuba ever since President Obama announced that his administration was working to restore ties with the island nation following five decades of hostilities between the two countries. Some of the articles took a political angle, some a business one, and others focused on anticipated opportunities for curious U.S. travelers. They are tempting and easy surface observations to make. Five minutes after you step outside the José Martí International Airport, you can’t help but be overwhelmed by the sight of 1950s-era Chevys with sharp tail fins chugging through the streets. Or the tableau of decaying baroque buildings, crumbling pillars and peeling paint. Not to mention a dearth of Internet connections. But the observations – and frequent descriptions about them – are just that: surface. In reality, Cuba – like all human societies – has been changing and did not stop doing so when relations with the United States ground to a halt. Instead, the last several decades have seen immense changes – in society and the economy, and particularly in music, arts and culture. Much of the revolution’s social gains have been recognized internationally, such as those in universal health care and universal education raising health indicators and literacy rates that meet or exceed U.S. levels. But while it was once described by international economists as one of the most egalitarian countries in the Western Hemisphere – particularly in regard to eliminating institutional racial barriers in education, health care and the professions – Cuba and the revolution cracked in the 1990s. After the collapse of the Soviet Union, its chief sponsor and trade partner, the country slumped into a deep depression known as the Special Period. What followed were massive shortages of food and consumer goods, a near-standstill in transportation and the worsening of an ongoing housing crisis. To salvage the economy, Cuba turned to tourism, foreign investment, limited private enterprise and legal possession of U.S. dollars, while most of the workforce still received salaries in pesos. New trade ties with Venezuela provided a life line. But many of the reforms begun in the 1990s have led to burgeoning social inequalities. Now some Cubans are doing much better than others, at times in inverse proportion to education levels. Some prosper from money sent from relatives living abroad or leave peso-salary professions in law and engineering to work in the more lucrative tourism sector and its access to foreign currency. Others sink further into poverty amid a shrinking social safety net, unable to get a foothold in the tourism sector and with no family overseas to send help. Changes in Cuban society and its economy are often most vividly expressed in its morphing cultural and music forms – a realm in which Cuba has long been a world power, since well before the revolution. While many Americans still associate Cuban music with the classics of the Buena Vista Social Club phenomenon – a 1990s film and album that sparked an international interest in traditional Cuban music – the young, talented musicians graduating out of Cuba’s network of classical music conservatories told me they call this “sopa” or soup music. It is music they learn to entertain diners at restaurants in the tourist district for tips in foreign currency. 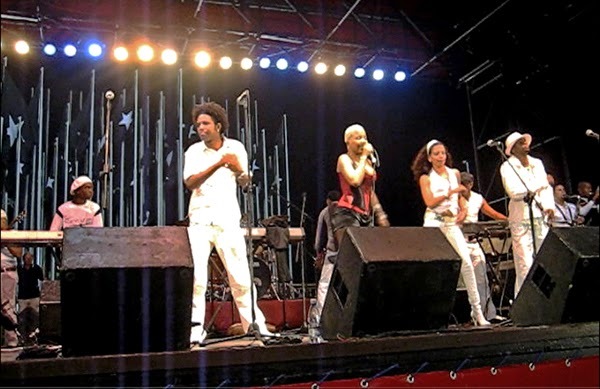 What is less familiar to U.S. ears is the music that has filled Cuba’s hot nightclub scene since the 1990s – a raucous new dance music called timba, whose most popular groups like Charanga Habanera have toured all over the world, with big followings as far away as Japan. Just because Cuba largely has been closed off to the United States the past several decades does not mean the rest of the world hasn’t interacted with the country. This has been the case even before Cuban musicians and artists (and Cubans in general) obtained more freedoms to travel after the recent elimination of the loathed “white card” permit previously needed to exit the country. Other music forms are constantly evolving, including Afro-Cuban jazz – whose earliest expressions left an enormous imprint on American music a century ago. And Cuban fusion and rap. Cuba’s raperos have been some of the most critical voices of the government’s shortcomings in living up to the revolution’s promises, of police harassment of black Cubans in the tourism districts, and the growing inequalities wrought by tourism and market reforms. Other major changes in the arts have been tracked by scholars like Harvard’s Alejandro de la Fuente – about painters, visual artists, filmmakers and intellectuals in other fields. Many of them have taken up themes and social issues on race and ongoing racism. This is new, as the topic was taboo for decades under the revolution, which sought to subsume the issue within the larger interest of national unity in the face of CIA-backed threats, and because it argued that socialism had ended racism. De la Fuente has been a curator on two art exhibits showing in Cuba and the United States dealing with issues of race. Hundreds of other cultural exchanges between Cuba and the United States have been taking place even under the embargo – with artists, poets, dancers and musicians, from all throughout Cuba traveling to San Francisco, Miami and the Lincoln Center in New York. The Americans exposed to this realize Cuba has not been frozen since the 1950s. Often the best place to see deeper social transformation is in the cultural realm. For one, the revolution has given culture a privileged place, wrote the above-mentioned Sujatha Fernandes in her 2006 book, Cuba Represent! Cuban arts, state power, and the making of new revolutionary cultures. Alternative political and civic spaces were closed off. But the revolution devoted enormous resources for conservatories and art programs. In this area, the government has been more tolerant of expression and social critique (always within limits, as those who crossed the line in the past faced consequences like blacklistings and professional Siberia). More recently, she wrote, there are practical reasons. The cultural producers attract tourists and foreign investment. Also, it’s a sphere where the population can relieve social pressure as the government tries to build a new conceptual framework for today’s realities, one now based more upon nationalism and national pride than socialism. In the more limiting area of politics, scholars like Armando Chaguaceda write about new groups trying to carve out independent space. These receive very little U.S. news coverage, which tends to focus on the Ladies in White and former political prisoners. Chaguaceda describes new movements and their initiatives that span everything from environmentalism to spirituality and demonstrations against racism. Some operate on the margins; some try to engage with the government; others are confrontational with it; some walk a fine line – resisting co-optation or association with U.S. groups. Others ask for more socialism and less bureaucracy, while fighting for a right to autonomous civic space. Every single Cuban I have ever met in Cuba said they want economic changes. The young especially are indifferent to politics. They want a chance to work in the profession in which they trained and not have to drive a taxi in the tourism district. Many are excited about the opening with the United States, while some are also leery about the form U.S. investment would take. The older ones watch the remnants of their generation’s sacrifices crumbling like the buildings in Central Havana, and worry if they will be further marginalized by growing inequalities. It remains to be seen how the recent changes will play out in Cuba, if a system will be set up to channel the resourcefulness of the booming black market upon which people have had to survive into a legitimized entrepreneurial sector. And also whether Cubans without relatives abroad or access to the tourism sector and unable to afford the exorbitant prices of newly legalized consumer goods will somehow benefit from all of this or continue to sink into deeper poverty. Meanwhile, tourists from other parts of the world, like Brazil, are rushing to visit Cuba before it is overrun by U.S. companies and consumerism. They and U.S. travelers bypassing the embargo until now use words like “charming” and nostalgic to describe the buildings and lack of a single McDonalds or Starbucks on the island. But what’s important to remember is that there are people who have lived in those photogenic crumbling structures so beautiful in their decay (a few of which have collapsed, killing the people squatting inside). In other cases – showing that things in Cuba are rarely what they appear to be – some of those dilapidated-looking buildings are decked out inside with new tile, furniture and appliances, paid for by family abroad. As for food, while the future will tell whether the Cuban people want – or the Cuban government will allow – the country to be inundated with the U.S. version of hyper-processed food production (and the obesity epidemic that goes with it), visitors should realize that what appears quaint and charming to tourists belies a reality of people who have spent the last few decades struggling to feed themselves. But beneath the surface are waves of ongoing deeper change – musical, cultural, economic and social. To catch them, you need to forget what you think you know about Cuba, be humble, and open not just your eyes but your ears, too. Labels: Cuba, Cuba travel, Cuban Culture, Embargo, Music, US Cuba ties. Obama’s $1 billion for Central America: More harm than good? All original content copyright Saundra Amrhein, January 2015 . Awesome Inc. theme. Powered by Blogger.